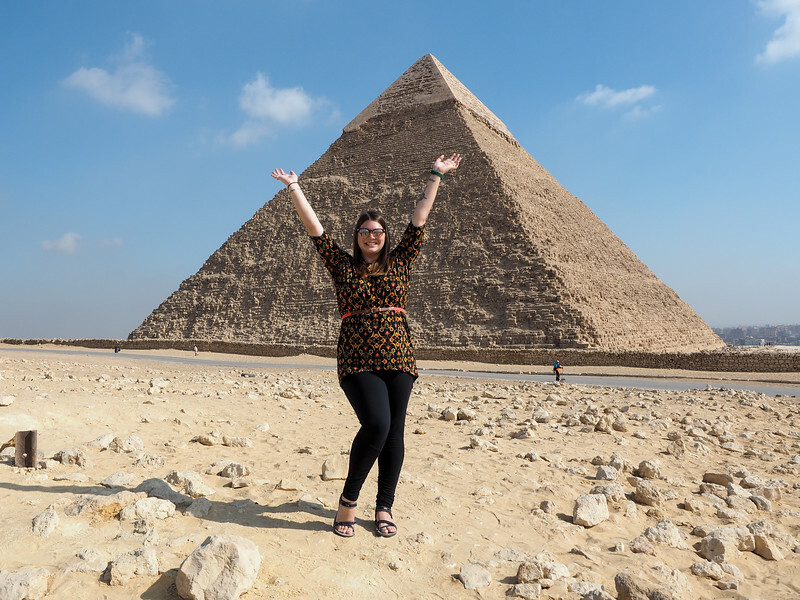 Even though Egypt has some exciting large cities and an interesting contemporary culture, I won't lie: the main reason I wanted to visit was for all the ancient sites. Ever since I can remember, I've wanted to visit Ancient Egypt. I wanted to see the pyramids and the tombs and all the hieroglyphics. 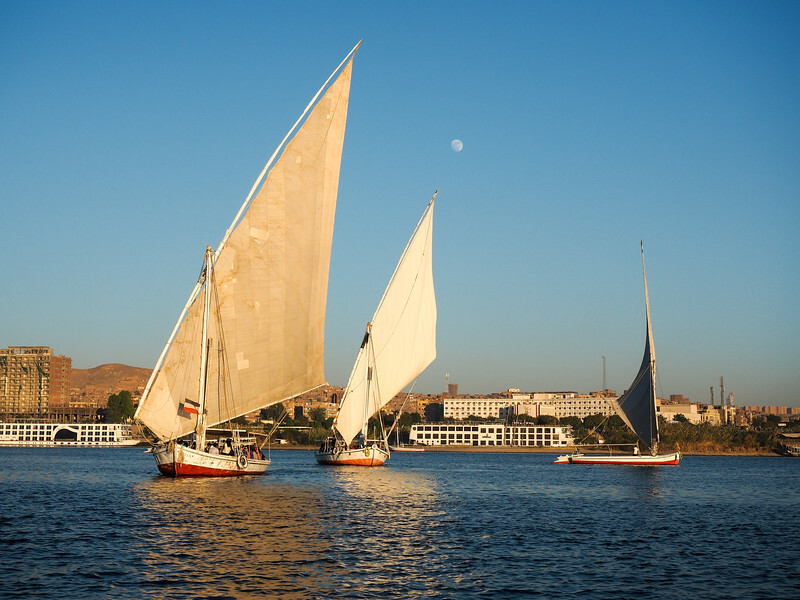 I wanted to ride a felucca and visit temples and essentially act out all the fantasies of my youth of being an Egyptologist. And I finally got to do that at the end of 2017. I booked a 12-day tour with Intrepid Travel that included all the highlights – and then some. 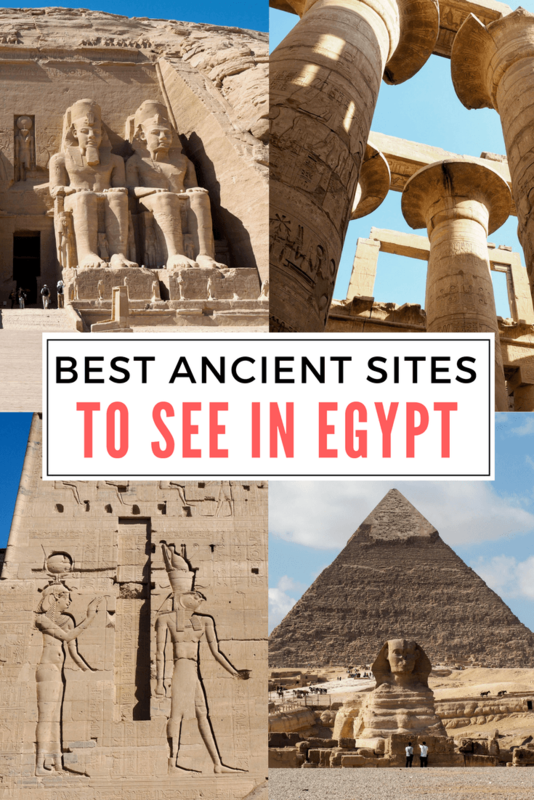 If you, too, dream of visiting Egypt for all the history, here are the ancient sites that I think are most worth seeing in-person. If one image comes to mind when you think of Egypt, there's a good chance that it's going to be the pyramids, or maybe the Sphinx. 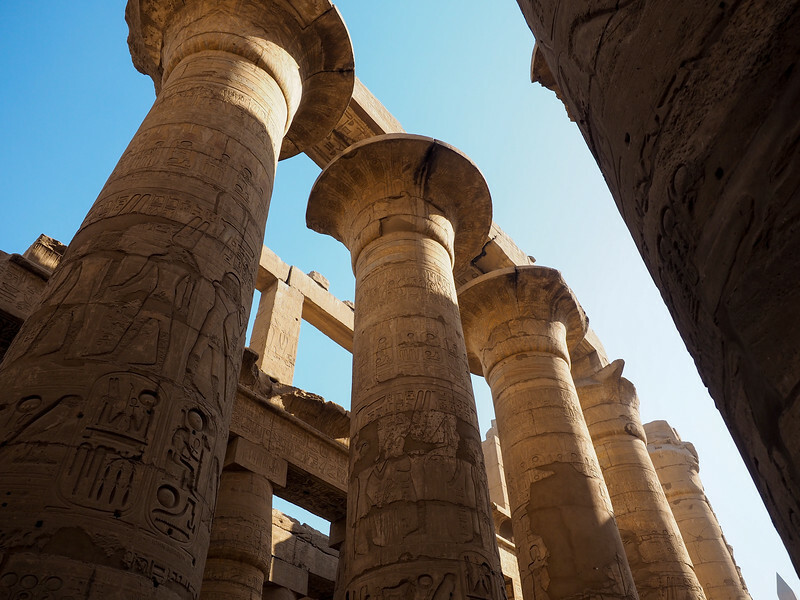 These iconic ancient structures have more or less become the symbols of Egypt, so it follows that they're the most popular sites for people to visit. The Great Pyramids of Giza are more than 4000 years old and are the only original ancient World Wonder still in existence. You'd think that something 4000+ years old would be in ruins by now, but things last a long time in Egypt – the pyramids are in great shape! 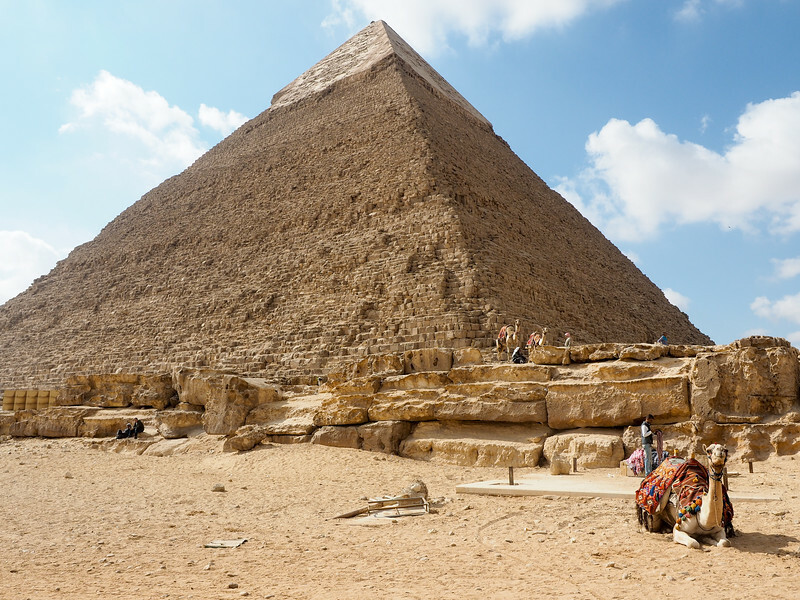 You can climb up into the pyramids (when I went, the Great Pyramid and the small pyramid were open to enter), but not ON the pyramids any longer. To be honest, though, I enjoyed seeing the pyramids from the outside better – they're hot and stuffy inside! 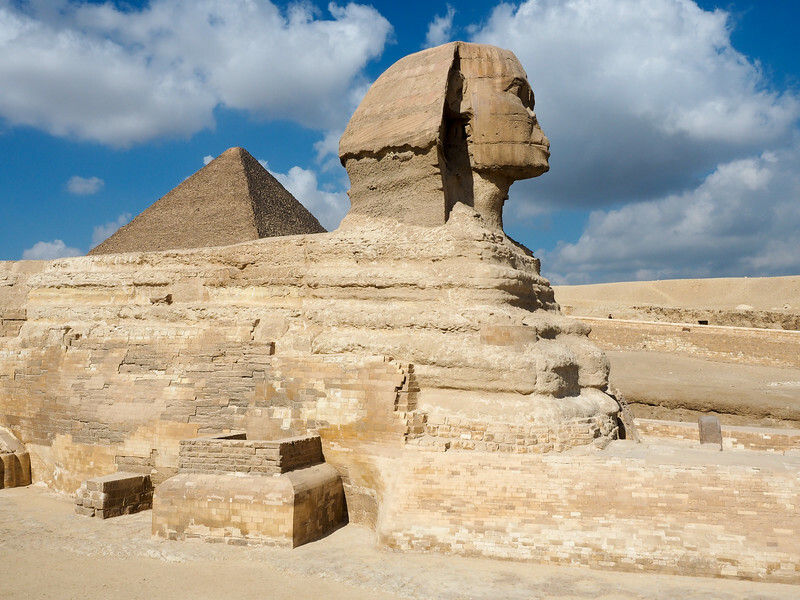 The Sphinx – the body of a lion and the head of a human – is closest to the Great Pyramid. And, while it's smaller than some people imagine, I was still ecstatic to see it in person. The details of the paws and tail are really cool. The pyramids are really close to Cairo – and Cairo can be extremely smoggy, especially in the morning. 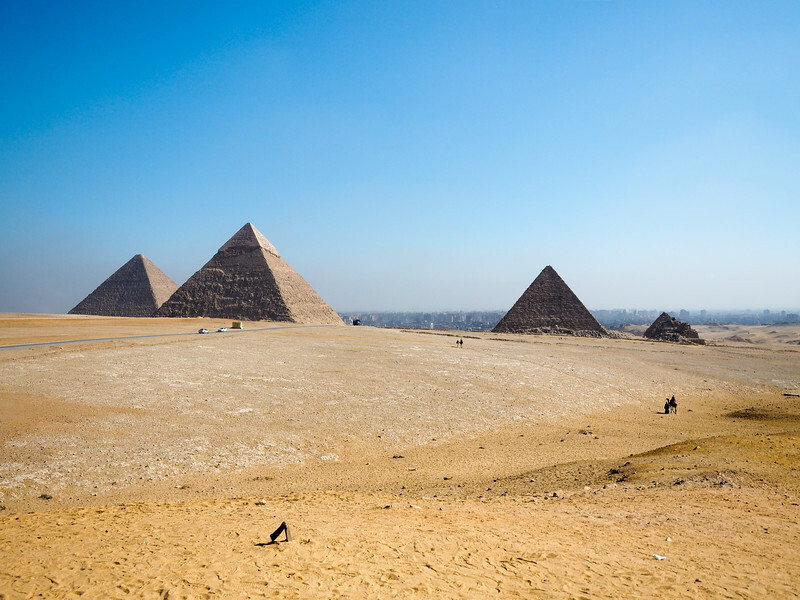 Visiting the pyramids in the morning is a good idea to avoid the heat of the day, but be aware that not every morning is going to be clear, even if it isn't cloudy. I lucked out with a pretty clear morning in Giza, but be prepared that it could take more than one attempt to see the pyramids like this. Also, if you want to take photos of the camels around the pyramids but aren't planning to go on a ride, expect to be asked for money for the photos you take. Pharaoh Ramesses II, who reigned for 66 years during Egypt's Nineteenth Dynasty, is known as one of the greatest leaders of ancient Egypt. And I think part of this is because of all the building he did during his reign to remind people how awesome he was. You can see the marks of Ramesses II at several of Egypt's ancient sites; and you can't miss them since Ramesses II loved to put his own face on things. The most famous site related to Ramesses II is Abu Simbel, a pair of temples south of Aswan, not far from Egypt's border with Sudan. 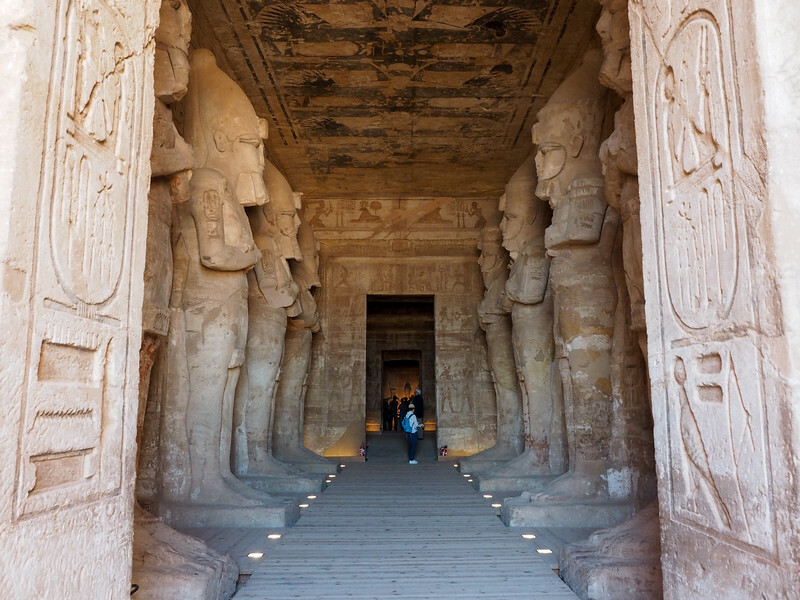 The temples – The Great Temple with huge statues of Ramesses II outside and the Small Temple, dedicated to his favorite wife Nefertari – date back to the 1200s BC and are both incredible, with intricate carvings still intact inside. This is all even more impressive when you learn that both these temples were completely relocated in 1968 in order to save them from flooding by the High Dam on the Nile River. They were moved with such precision that everything looks exactly as it did before the move. They even repositioned everything so that twice a year the sun still shines through the doorway of the largest temple to illuminate statues in a room at the very back. The second temple at this site is dedicated to Hathor (the fertility goddess) and Nefertari (Ramesses' favorite wife), and also has nice carvings inside to see. 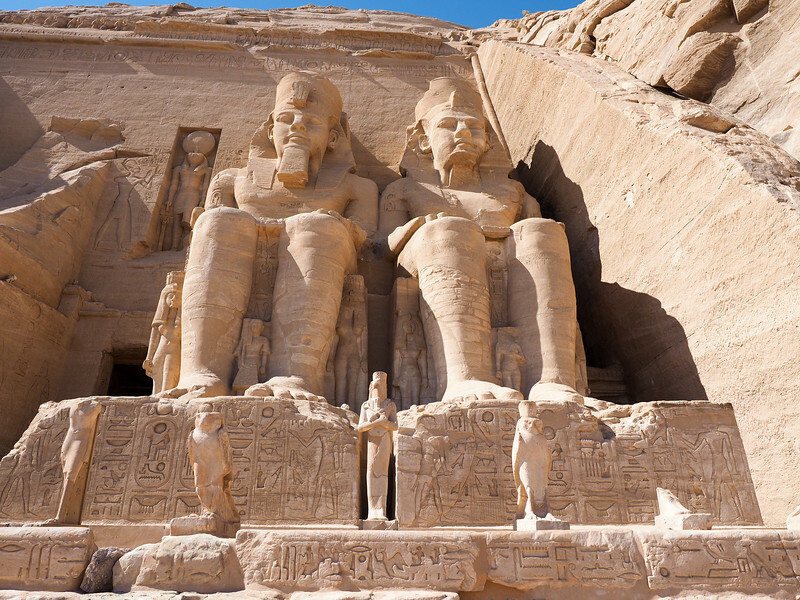 There are two ways to get to Abu Simbel: by bus or by plane. 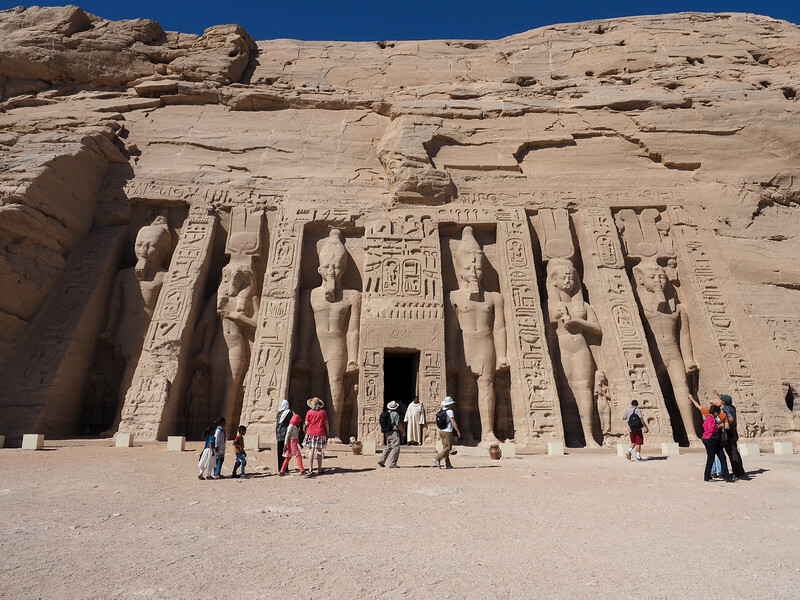 The tour I did included roundtrip flights to Abu Simbel from Aswan, which is definitely the way I would recommend going if you can. 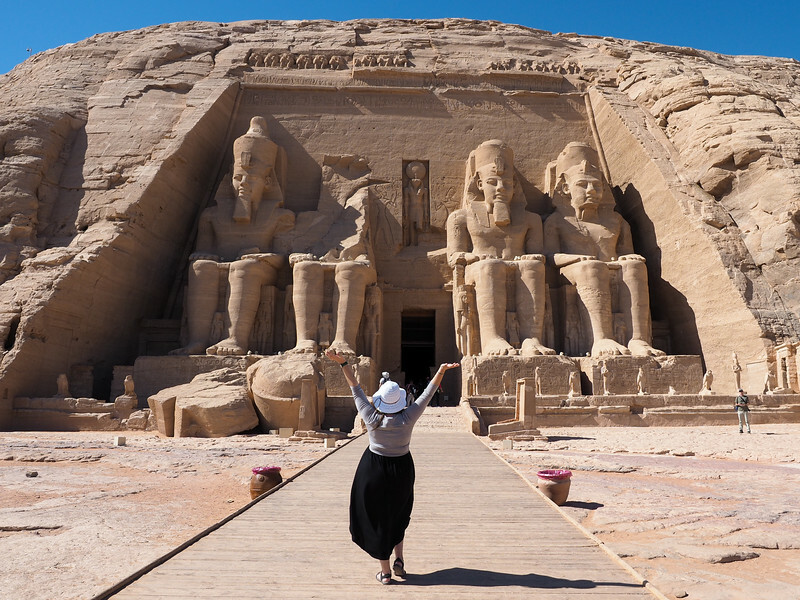 It's a short flight (less than 40 minutes), and flying means an Abu Simbel trip only takes half a day. If you go by bus, you'll leave Aswan between 4 and 5 in the morning, and the drive takes roughly 3.5 hours each way. You're also not supposed to take photos inside the temples, though one or two people in my group did after slipping some money to the guards. This is pretty common practice in Egypt, but keep it in mind if a local comes up to you and encourages you to take photos inside Abu Simbel. They're going to ask you to pay them if you snap that pic. Just as I don't think you can visit Egypt without seeing the pyramids, you also shouldn't go without visiting the Valley of the Kings in Luxor. This is where all the famous pharaohs of ancient Egypt were interred. And, even though almost all of the tombs were looted long ago (“in antiquity,” as most of the signs will say), the carvings and paintings inside are still in-tact in most of the tombs. This is a popular place for both international and Egyptian tourists to visit, so you can expect it to be pretty busy. But, it's such an iconic site that you should definitely still go – just go as early as you can. 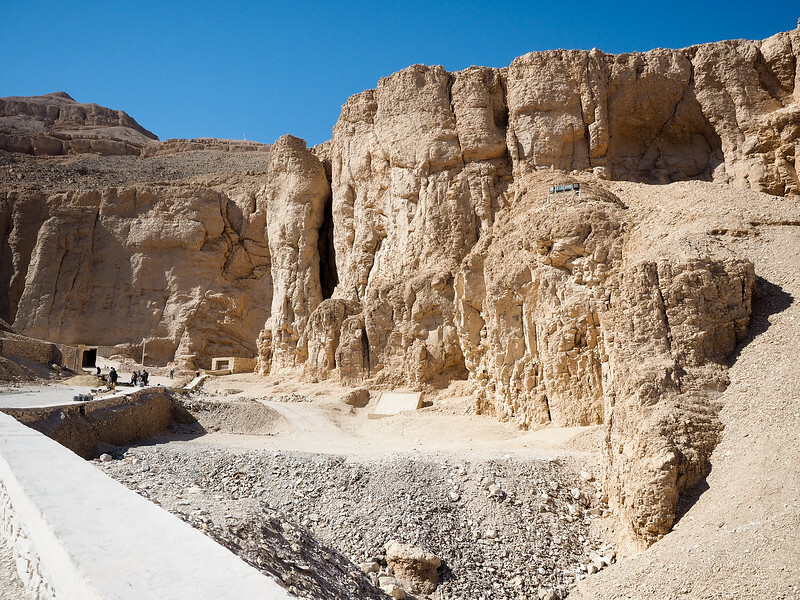 The tombs open to the public at the Valley of the Kings often change based on restoration projects and for preservation's sake. But there are always a handful to chose from, most of which still have intricate carvings and original paint preserved inside. Some tombs are larger than others, and most require you to head down steps to see their main chambers. 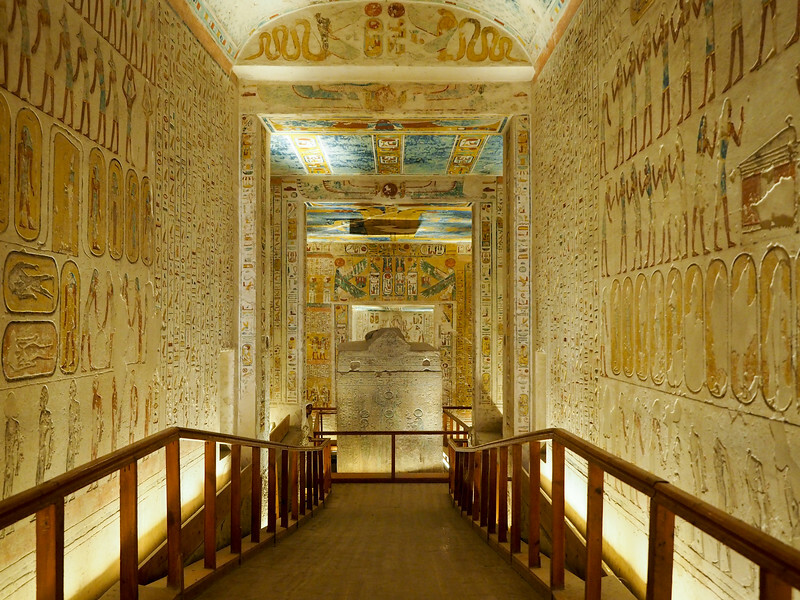 My favorite tomb I visited was that of Ramses IV – the colors inside were pretty amazing! Our guide's favorite is the tomb of Tutmosis III, because it has unique stick figure drawings inside. Your main Valley of the Kings ticket will get you entry into any 3 of the “included” tombs that you want. (When I went, there were 9 open “included” tombs to choose from.) Some tombs – like the small tomb of Tutankhamun, the tomb of Seti I, and the tombs of Ramses V and VI – require separate entrance tickets that can range in price from 50 Egyptian pounds to 1000 Egyptian pounds (King Tut's tomb was 200 EGP to enter when I was there). As of 2017, they are now offering photo passes for the “included” tombs, too. This pass costs 300 EGP (about $16 USD), and allows you to take photos inside the 3 included tombs you visit. Beware, though, that the minders inside the tombs are VERY serious about checking these passes! Don't try to take photos without one. The Abu Simbel temples weren't the only ones relocated after the building of the High Dam in Aswan. 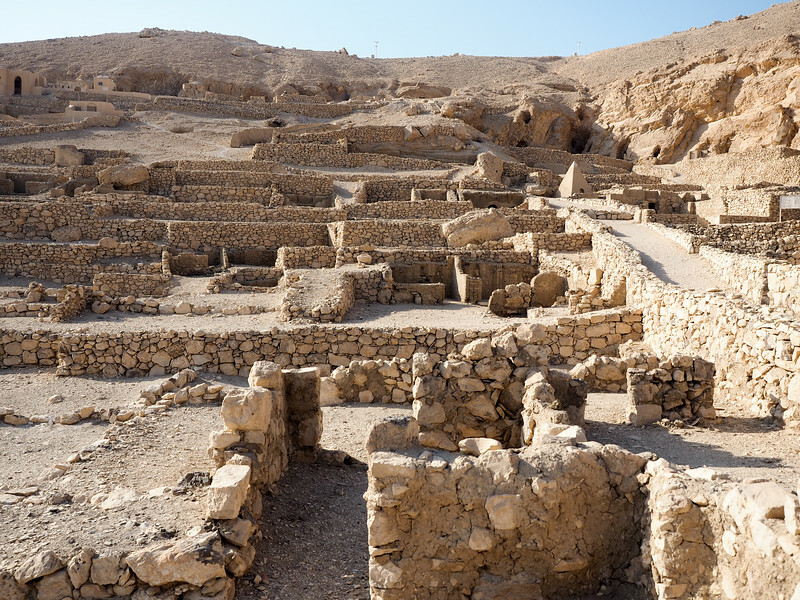 In fact, between 1964 and 1980, no fewer than 22 monuments and temple complexes were completely relocated in order to save them from being submerged in Lake Nasser. 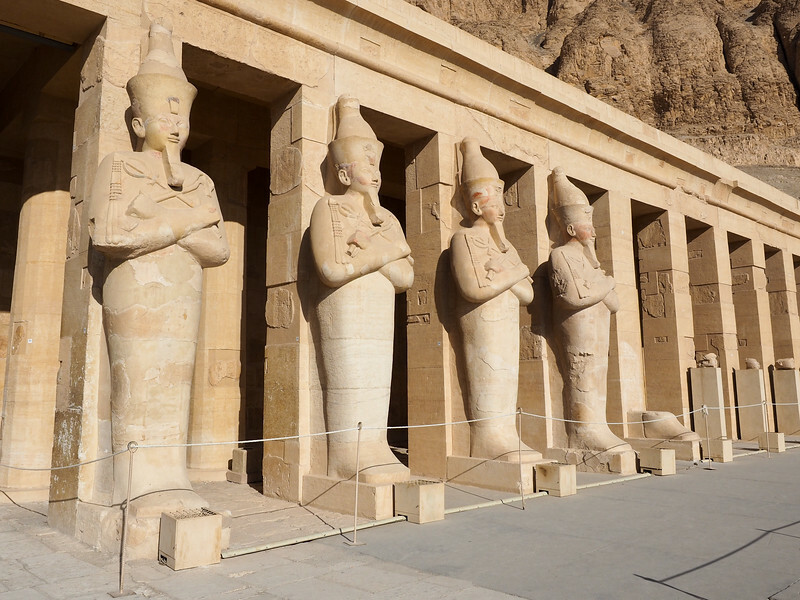 Philae Temple was one of these, and now sits on Agilka Island in Aswan. Philae is unique in that it was used mostly during the Ptolomaic Dynasty – the last dynasty of ancient Egypt before it was conquered by the Romans and the ancient Egyptian religion began to give way to Christianity. The temple was dedicated to the goddess Isis (and also connected to her husband, Osiris, and son, Horus), but later was used by early Christians as a church. Philae is impressive from the moment you first see it. There's a double colonnade leading up to the main part of the temple. The main temple has two facades and contains a collection of smaller temples, with the story of Osiris carved into many of the walls. But you can also see evidence of this temple being used by early Christians. Many of the carvings and hieroglyphics have been effectively been chiseled away (it's especially noticeable in the faces of the Egyptian gods), and you can also spot the Coptic Cross carved into parts of the temple if you look closely. 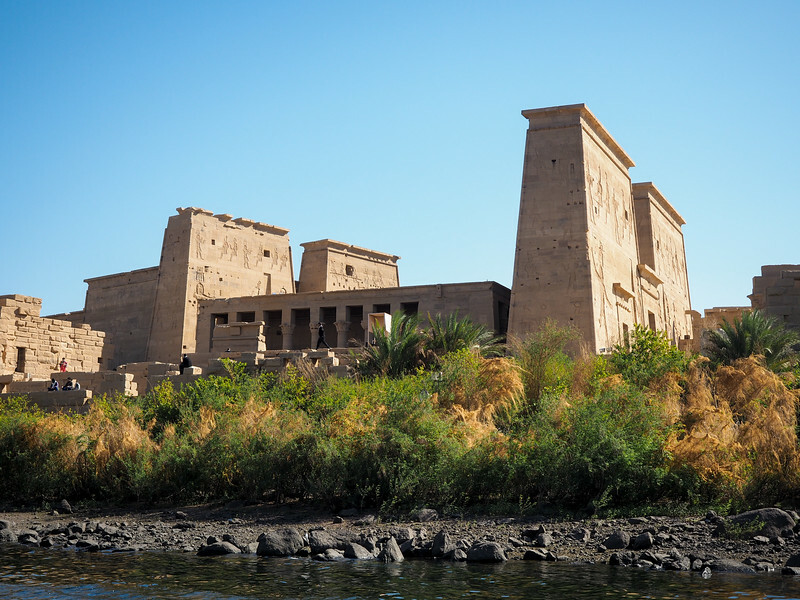 Since Philae Temple sits on an island in the Nile, you have to take a boat to get to it. 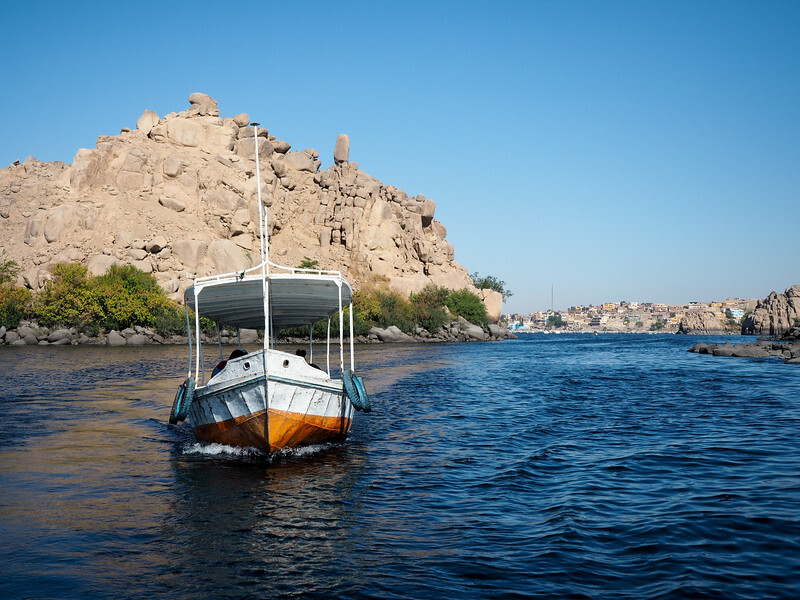 Special water taxis exist in Aswan for this purpose. 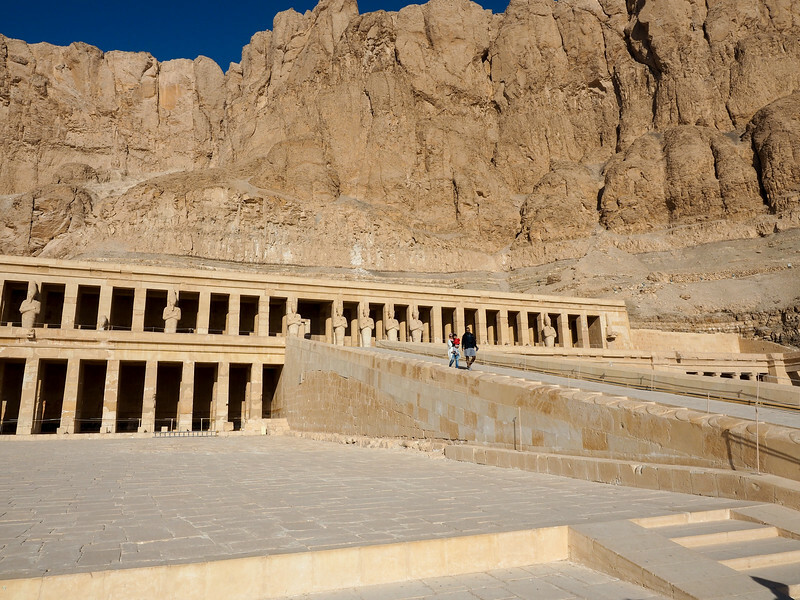 The Mortuary Temple of Hatshepsut was one of my favorites in Egypt for two reasons. For one, it looks very different from many of the other temples there. And for two, it belonged to one of ancient Egypt's badass boss babes! You've probably heard of Hatshepsut; she's regarded as having been a very successful ruler of Egypt during the Eighteenth Dynasty, and is one of the most famous female pharaohs. But she was never meant to to rule ancient Egypt. Hatshepsut was the only child of Tutmosis I and his royal wife. Usually only children born to a pharaoh and a royal wife could rule Egypt, but back then women did not ascend the throne. In order to try to get what she felt was rightfully hers, Hatshepsut married her half-brother, Tutmosis II (son of the pharaoh and a secondary wife), who eventually took over ruling Egypt. And when Tutmosis II's son from a secondary wife (Tutmosis III) was set to inherit as a child, Hatshepsut sent him off to military school and ruled Egypt herself. Unfortunately, after Hatshepsut died and Tutmosis III took over, he set out to erase his step-mother's name from record. He wrecked most of her temple, knocked down her obelisks in Karnak, and chiseled her name out of cartouches and temples. Thankfully, most of her funerary temple has been restored. 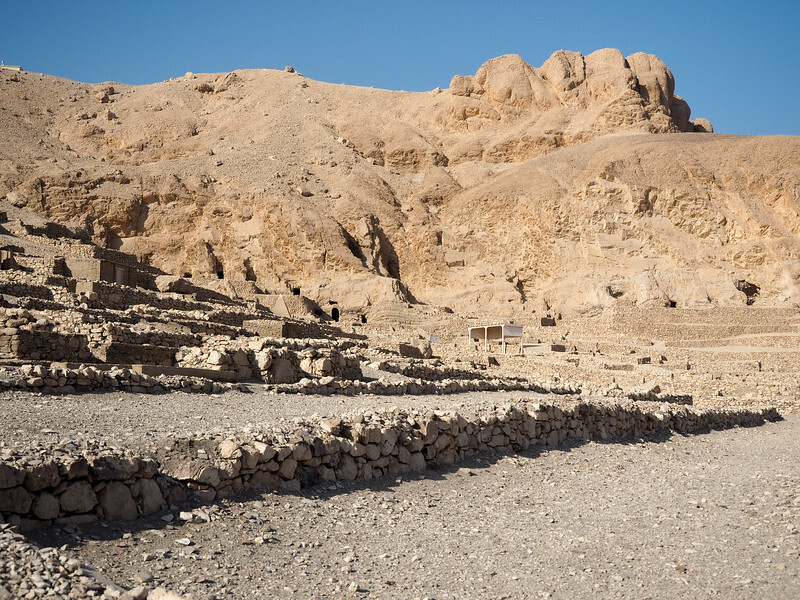 You can still see most of the temple, including some well-preserved carvings and the famous statues that Hatshepsut had built of herself. Hatshepsut was all about proving that she was just as strong and capable as any man. This is reflected in these statues, which are dressed like men and are even wearing the false beards that represented wisdom in ancient Egypt. This temple is on the West Bank of the Nile in Luxor, which is in southern Egypt. It can get VERY hot here – temperatures frequently surpass 80 F in the winter, and soar above 100 F in the summer. Hatshepsut's temple offers very little shade, so it's recommended to visit early in the day and definitely bring a hat and water. Luxor was the capital of ancient Egypt during the New Kingdom (back then it was known as Thebes), and today is regarded as basically one big open-air museum because of all the ancient temples and ruins that can be found there. 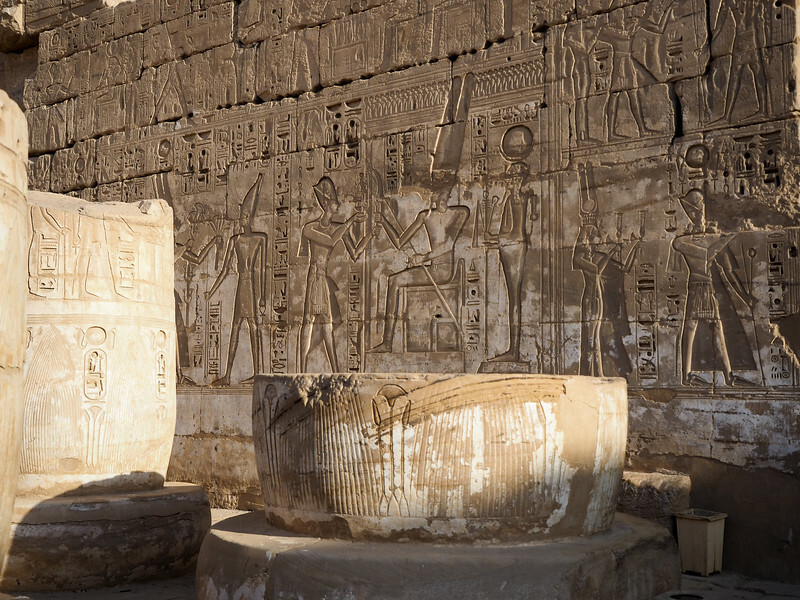 The real star of the show, though, has to be the Karnak Temple Complex. 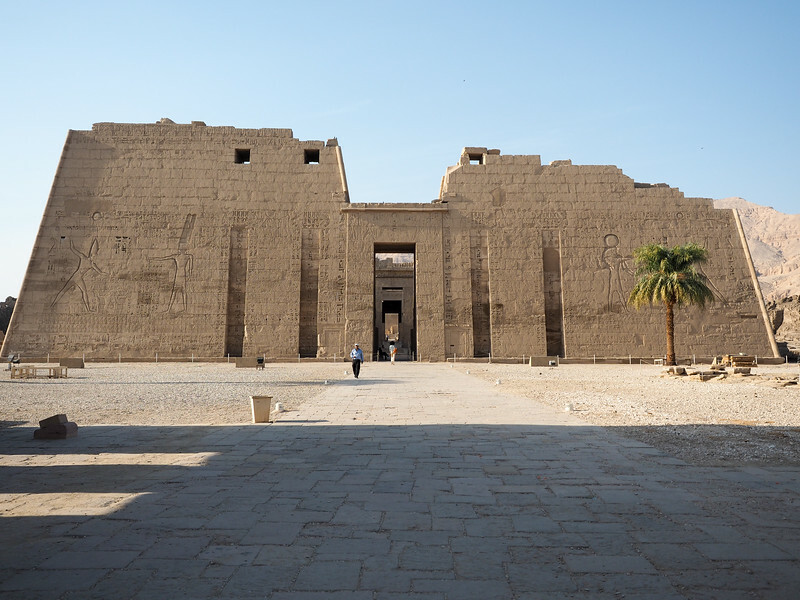 You have to call Karnak a temple complex rather than just a temple because it is truly HUGE. It's comprises temples, obelisks, columns, and other buildings dedicated to the Theban triad of Amun, Mut, and Khonsu that were constructed over the course of 2000 years throughout the Middle and New Kingdoms. 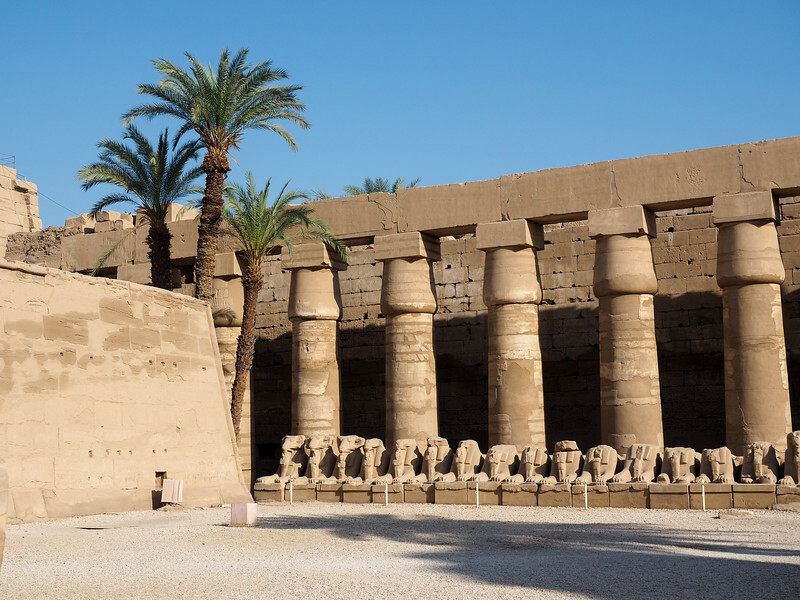 Because of it's sheer size, the Karnak Temple Complex is usually regarded as one of the largest religious sites in the world. Visitors can only see the largest portion of the temple complex, but it still takes hours to properly explore. 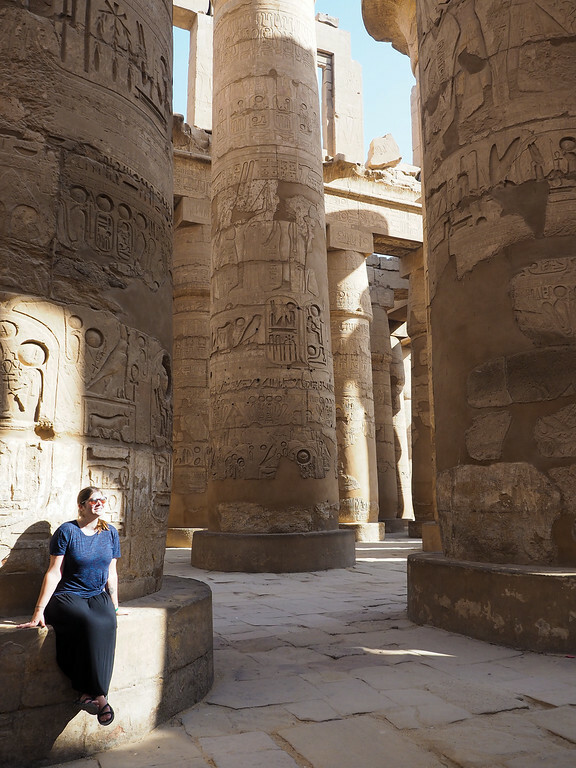 You can see everything here from carvings to obelisks to statues, but my favorite part was definitely the Hypostyle Hall, a 54,000-square-foot roofless “room” featuring 134 giant carved columns. I could have wandered around here for hours! Like with many of the other main sites in Luxor, the Karnak Temple Complex can get very crowded. Karnak is usually regarded as the #2 tourist site in Egypt after the pyramids in terms of visitor numbers, so you can imagine how many people pass through every year. In order to avoid the largest crowds, go early in the morning or later in the evening. Like at most temples in Egypt, everything here is lit up at night. And now we get into the part of the list that's slightly more obscure. I can't say I'd heard of Medinet Habu before going to Egypt. But after a morning at Karnak, our guided suggested we use a free afternoon to see some more sites on Luxor's West Bank – sites that most people skip. 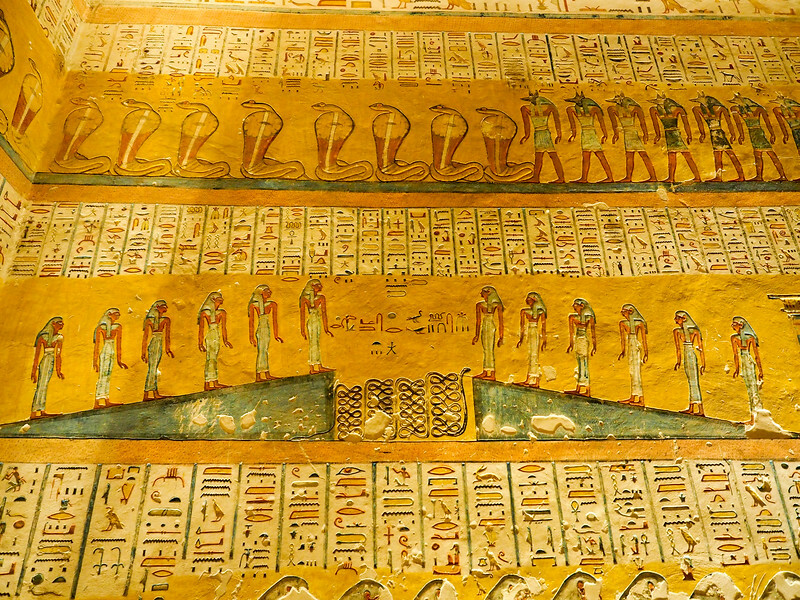 Habu Temple – the Mortuary Temple of Ramesses III – was one of those sites. It's a fairly large temple with traditional New Kingdom temple construction. But the difference was that there was basically no one else there! Habu Temple is best known for its well-preserved wall carvings (they are EVERYwhere). There's also a decent amount of ancient paint still visible on many of the columns, especially in the peristyle hall. This paint is what impressed me the most about this temple! 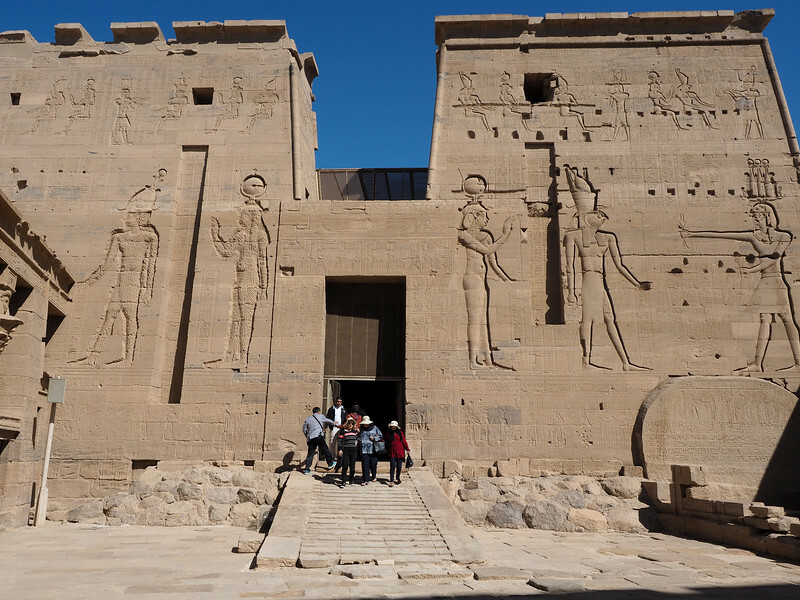 If you want to get away from the crowds in Luxor, this is a great temple to visit. 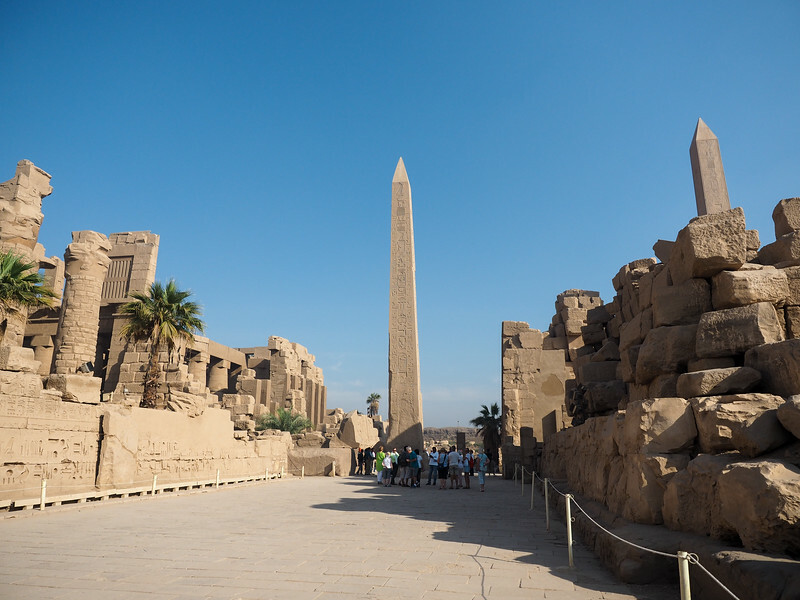 Our guide told us that most people just hit up Karnak, Luxor Temple, and the Valley of the Kings in Luxor, meaning any step off the beaten path will mean that you'll basically have the place to yourself. The other off-the-beaten-path site we visited in Luxor was Deir el-Medina, the ruins of an ancient Egyptian village where all the workers and artisans that built the tombs in the Valley of the Kings and Valley of the Queens lived. Because this is where they lived and died, you can also find tombs of these workers here – which is why we went to visit. There's not much left of the village above-ground – just ruins of walls and buildings, mostly. But below-ground, many of the workers' tombs are extremely well-preserved. The difference between these tombs and the tombs of the pharaohs is that the paintings and carvings inside the tombs of the workers depict scenes of everyday ancient Egyptian life. Our favorite paintings included detailed black-and-white cows. You can also visit the nearby Temple of Hathor, which (like many Egyptian temples) was re-used by early Christians once the village was deserted. Monks took over the Temple of Hathor, and it was then referred to as Deir el-Medina (“Monastery of the Town”), which is now the name for the entire site. You aren't allowed to take photos inside any of the workers' tombs – but you'll likely be followed by a local minder who will tell you to take photos anyway, and then ask you for money. This is also another site where there's very little shade, so be sure to come prepared with a hat, sunscreen, and plenty of water to drink as you explore the village ruins. Even though it itself isn't an ancient site, I'd be remiss if I didn't mention the famous Egyptian Museum here. 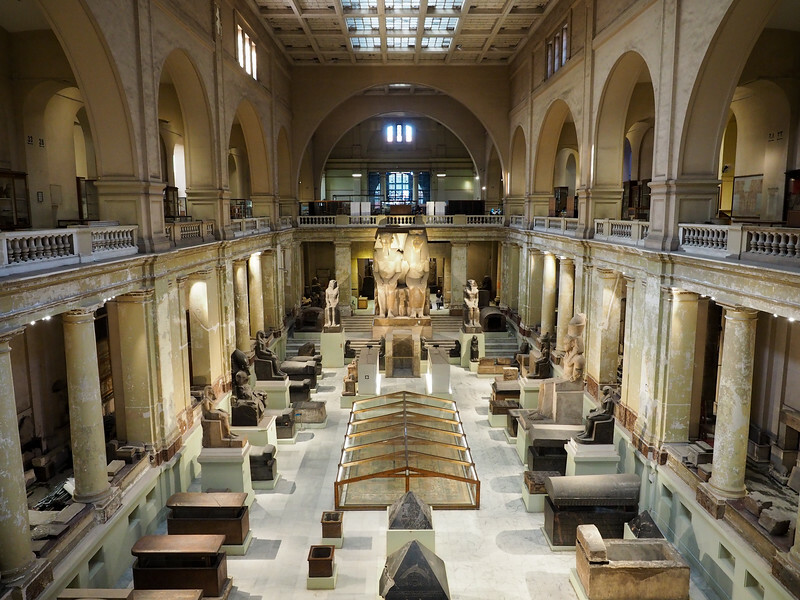 The Museum of Egyptian Antiquities in Cairo is home to a massive collection of ancient Egyptian antiquities, from statues to mummies to the treasures that would have been found inside ancient tombs. 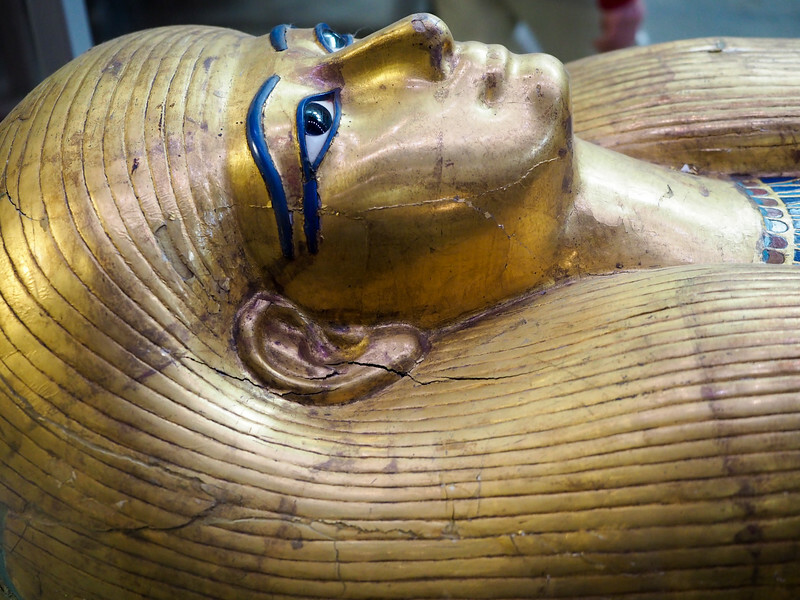 This is also where you'll find the contents of King Tut's tomb, including his golden funerary mask and sarcophagus. While the current museum could definitely use an upgrade when it comes to lighting and the general layout of displays, you can still see some incredible things here. My favorites included the treasures found in King Tut's tomb (the ONLY ancient Egyptian tomb that has ever been discovered in-tact and not completely looted), the room dedicated to the unique artwork under the pharaoh Akhenaten, and the rooms full of mummies. The mummy rooms do require an additional entry ticket, but I think it was worth it. They have mummies of famous pharaohs like Ramesses II and Hatshepsut, and seeing them up close will make you marvel at the whole mummification process. A random sarcophagus – you can't take photos in the mummy rooms, or of King Tut's treasures. Eventually, everything inside this museum will be moved to the Grand Egyptian Museum, which is currently under construction in Giza. The new museum will display more artifacts (hopefully under better lighting! ), and they say will be partially opened in 2018. Entry costs for most sites seem to be changing right now in Egypt as tourism finally starts to rebound in the country, but most places had entry fees between 50 and 100 Egyptian pounds. Have you ever been to Egypt? If not, which site would YOU most want to visit? This pictures are gorgeous! I remember learning about Ancient Egypt in the 4th grade, and I’ve wanted to visit since then. Thanks for sharing! Thank you! I really enjoyed taking photos at all these sites! There was so much to see and take in. 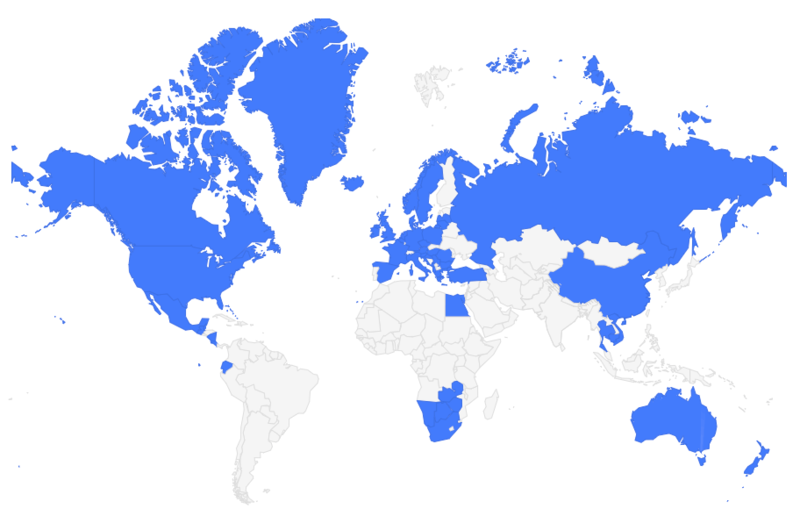 Thank you so much for sharing your travels. I look forward to and eagerly read all your posts. Egypt is one of my favorite places on the planet–we’ve been there 5 times and had some truly wondrous travel experiences there. 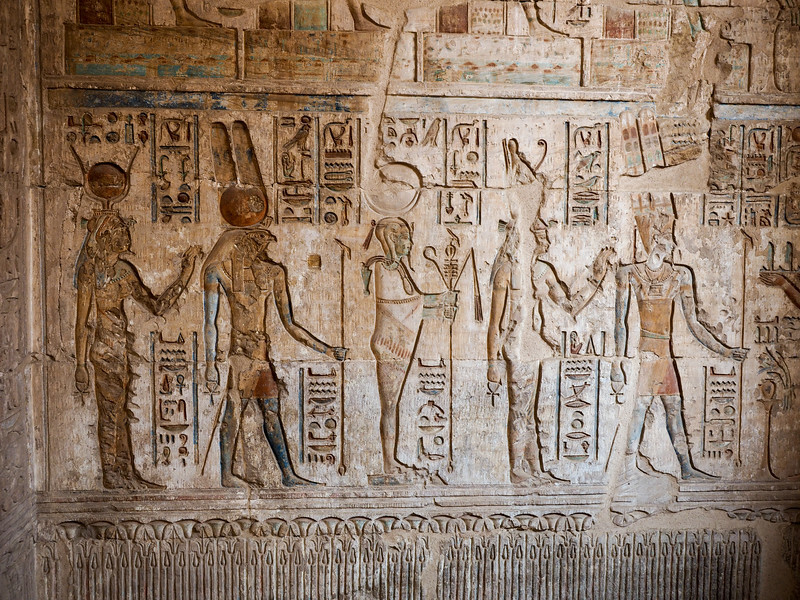 I love all the sites you mentioned, but my favorite is one you didn’t–the temple at Abydos. I wish our photos were half as good as yours! There are so many incredible sites in Egypt, aren’t there? I’m sure you could make multiple trips and still not see them all. Gorgeous! I used to be obsessed by Egyptian history, so I love these sights. It surprises me how quiet it seems to be there. There are hardly any crowds! That’s definitely thanks to the dip in tourism Egypt has seen since its revolution – tourism numbers aren’t even back to half of what they were pre-2011! But going to sites earlier in the day also seemed to be a great way to avoid most of the other tour groups. So jealous that they now allow photography in some of the tombs in Valley of the Kings. I also would say Abydos and Dendera should be on the list. 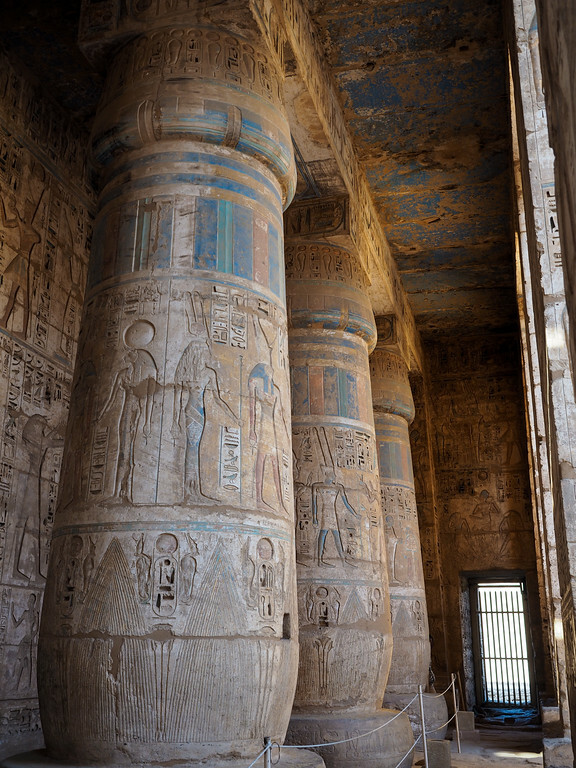 I was lucky to be allowed into the underground chambers of Dendera and visit the smaller temple on the roof there! Yes I think the photo pass at the Valley of the Kings is something they just started in the second half of 2017 – I’m definitely lucky that it was offered when I was there! Thanks for the beautiful descriptions. Gonna visit Egypt in March and so looking forward to seeing it in person. Truly is a childhood dream that I, for some weird reason, always postponed! Thanks for the write up. Those statues are beautiful. I am going here in 6 months with some friends. Thanks for the guide! I hope you enjoy it and get to see some of these sites! A great compilation and brings back great memories of our recent visit in May of 2018. People seemed surprised that we went to Egypt being from the US (I took my girlfriend and my 19 year old daughter)! The locations were amazing, there were virtually no crowds, and we had no issues with the people. In fact the Egyptian people were nothing but amazing towards us, very proud and very passionate, we loved hearing their stories both personal and historical. The Pyramids were everything I had ever hoped for and more, I didn’t think anything would come close until we took our trip to Luxor. 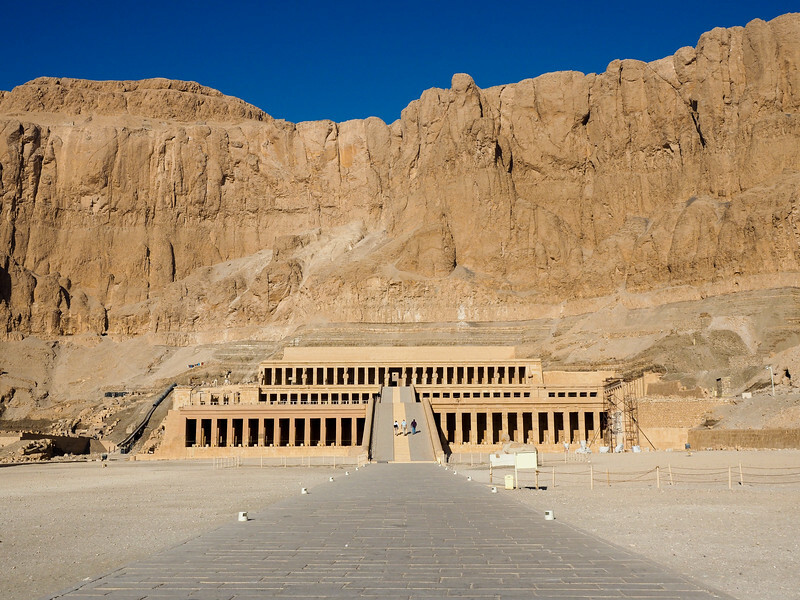 Valley of the Kings, Temple of Hatshepsut, Temple of Karnak, and Temple of Luxor…. all just amazing places. A private guide was perfect for all of our excursions. If I did my trip over again I would have skipped the day trip to Alexandria and went back to see the Pyramids a 2nd time (and seen Saqqara). So glad to hear that you had a great trip to Egypt too, Doug! It’s certainly a fascinating place, and now is a great time to go! Thank you for reducing my stress and increasing my enthusiasm to see ancient sites in Egypt. I am headed there in May for only a few days after our time in Crete. Your guide reminded me of names and appearances of sites so now I can make my own bucket list! BTW Please tell me you’ve read Elizabeth Peters’ “Amelia Peabody Series.” A female Egyptologist in the late (?) 1800’s. Wonderful way to make the sites come alive. Very grateful. Happy to be able to help! I hope you have a great time! So awesome. I’m am teaching an Oral English lesson in China on the new found tomb that is so colorful. These photographs will help me show the students why this find is so important and will also show them some Egyptian antiquity. Happy to be able to help, Dave!